SIZES AVAILABLE: 1 LB, 2 LB, & 5 LB Bulk Bags Available - all come in a high quality foil bag with a valve. Stone Street Coffee Roasters is located in Brooklyn, NY. 100% COLOMBIAN SUPREMO Unroasted Green Coffee: our raw whole beans are the best quality & top grade Arabica beans in South America. EXTRA LARGE NATURAL BEANS (SCREEN SIZE: 17/18): create intense flavor, rich aroma, & a unique smooth taste that only Colombia is known for producing. ROASTING LEVEL RECOMMENDATION: a Light to Medium roast will highlight this bean's full-bodied flavor & bring out its mild, almost sweet taste. This is the perfect bean for at-home roasters. VARIETY OF BAG SIZES: we offer our coffee beans in 1 LB, 2 LB, & 5 LB kraft bags. The 1 pound bag is re-sealable. All bags are made from high-quality foil to ensure optimal freshness. 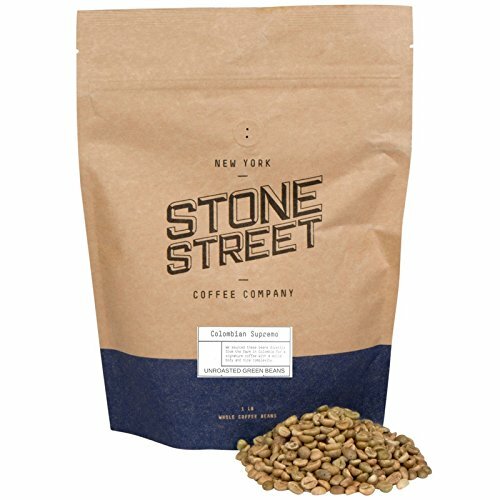 STONE STREET COFFEE ROASTERS: is an artisan coffee roaster located in the city that never sleeps - New York City, NY USA.